I don’t know what brand the actor wearing, but this Bugatchi Uomo shirt looks a lot like it. Shades of purple, including iris, have also been hot with professional athletes and other TV stars as well. From the Bugatchi Uomo fall 2012, winter 2013 Signature collection this new shirt has a spread collar. Bugatchi combines classic style with fashion colors, beautifully crafted in shaped or regular fit. The Bugatchi brand has a strong following for their soft, long lasting shirts that don’t pill or fade. CEOgolfshop offers this new collection of 24 new Bugatchi men’s button down shirts in sizes small to XXL. Stripes, plaid, and funky These shirts are a small segment of the overall Bugatchi Spring/ Summer 2011 Collection. CEOgolfshop.com offers the full line of Bugatchi Uomo Apparel for individual and wholesale purchase. Not all items are online. We encourage our customers to call or email with size, style, and color preferences and we’ll create custom offerings for you. Not all the shirts in this group are in the online store, so call or email to order. 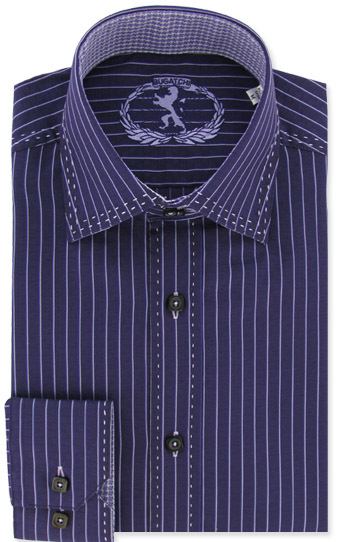 New Bugatchi Uomo men’s eggplant dress shirt, the hot color being worn by celebrities this season. From the Bugatchi Uomo Signature Collection, the rich, deep color of this shirt is great for a wide variety of skin tones. This is a ‘shaped’ shirt for a fit body.